Former cabinet minister and BJP leader Subramanian Swamy gave the yearning of the Gorkhas for a separate state a fresh lease of life on Tuesday with his words: “Gorkhaland is now only a question of when and not why.” In his maiden visit to the Darjeeling Hills, he was speaking at the two-day national seminar on Creation Gorkhaland and Smaller States. Recalling Narendra Modi’s election campaign speech for the BJP candidate in Siliguri in 2014, Swamy said he would remind the Prime Minister about his promise. “In his speech Modi had said ‘the dreams of the Gorkhas were his.’ When I return to Delhi I will remind him about his promise and ask when it would become a reality” he said to the applause of the crowd attending the seminar. Swami, an economist who is well-known for his sympathies for creation of smaller states encouraged the Gorkha Janmukti Morcha (GJM) leaders spearheading the statehood movement to keep up the momentum. “Gorkhaland ko koi rok nahi sakta (no one can stop Gorkhaland being formed) and the question now is when Gorkhaland and not why. Believe in the provision of the Indian constitution,” Swamy said adding he would talk to people in the corridors of power to bring the Gorkhaland demand in Parliament. In his speech Swamy also said that the BJP would not forget the gestures of the GJM in supporting its candidates in the last two Lok Sabha elections. “The Gorkhas are brave and loyal. You (GJM) sacrificed the seat and not only supported the BJP candidates in 2009 and 2014 but also made them MPs. You have been our ally since 2007. We at the BJP will not forget your gesture and will continue to work for you till Gorkhaland is achieved. In fact, I want you to say to the present government in Bengal that your goal is very near,” he said which brought another round of vociferous approval from the crowd. He was also of the opinion that creation of smaller states would not be negative for Bengal or for the country, unlike theories that circulate every time such a demand is made. “There are provisions in our Constitution that confers powers to the Center to protect it. Smaller states will bring in vast development as has been proved by new states that were formed, only recently. 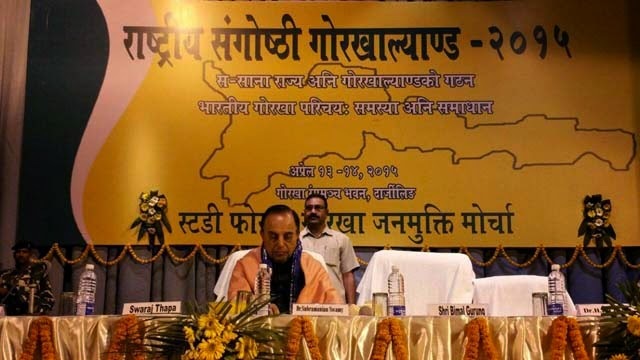 Moreover, no one will go to Pakistan or Bhutan if a Gorkha state is created,” Swamy pointed, who had been in the forefront to voice and also participated in the struggle for creation of the Uttarakhand and Telangana states. The BJP leader also advised the GJM leadership to emulate the steps taken by the Uttarakhand agitators till its demand was fulfilled. “You should start what we did in Uttarakhand. Demand for an additional DGP and chief secretary in Darjeeling. I have come to know that the SP is the highest police officer in your territorial administration. If you have an ADGP and additional chief secretary you need to take directions from Kolkata. Similarly, ask for a high court bench to be established in the Hills,” suggested Swamy. Echoing similar sentiments, BJP’s national coordinator Mahesh Chadda and CPML (L) secretary Abhijit Majumdar from Siliguri also asserted that creation of a Gorkhaland state was imperative for the all-round development of the region.